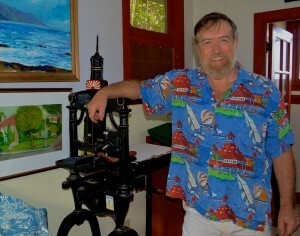 James Rumford, lives and works in Honolulu, where he creates children’s books that are not only impressive in their artistic vision but amazing in the variety of media used to create the artwork contained in their pages; these include watercolor, oil, pen and ink, gouache, digital, sepia wash, gold leaf and more. He is constantly exploring new techniques and so, unlike some illustrators who stick to a consistent look, all of his works look unique and original. 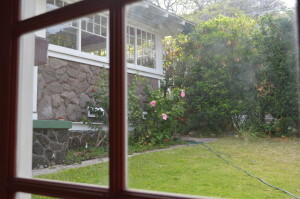 So that’s how we ended up in Honolulu sitting on the steps, waiting for Mr. Rumford to answer the door. I had brought along my daughter and a friend to meet the well-known author-illustrator. Finally, the door opened, and a very surprised but friendly James explained that he had been in the middle of fixing the downstairs toilet. He had not been expecting me since I had neglected to confirm the visit in my last email. 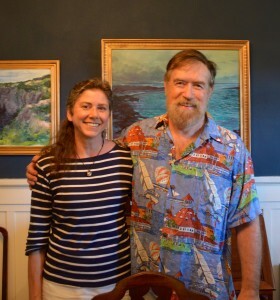 I apologized profusely, but he graciously welcomed us in and then zoomed off to fix us a refreshing drink while we oohed and aahed over the beautiful ocean landscape paintings hanging on the walls of the living room and dining room. 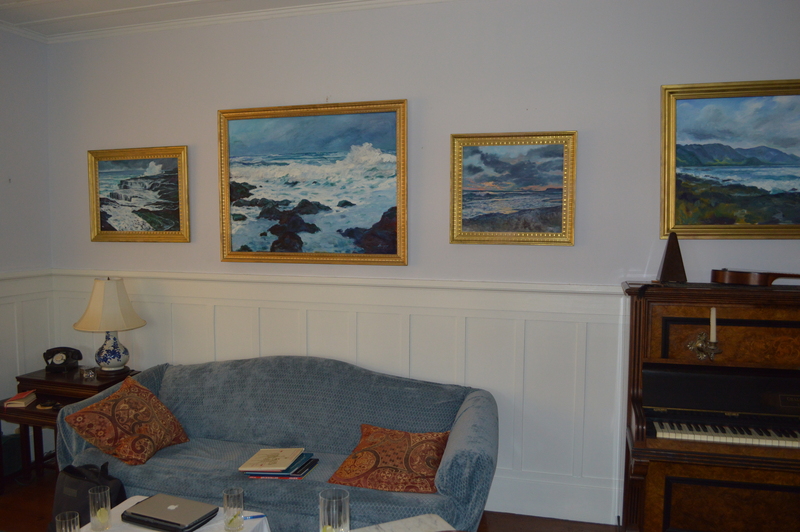 When he returned, he explained that all of the paintings were ones he had completed in the last year. 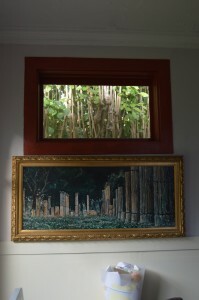 In the window seat, he had a stack of library books, including “Le Petit Prince” in the original French. I soon discovered that he could chat with me in French and that he could speak, read and write in Arabic, Chinese and other languages. 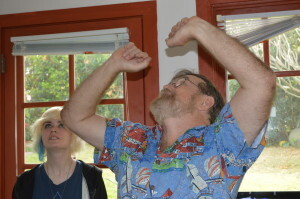 A polyglot artistic Renaissance man who is also willing to fix his own toilet! Impressive. We fell into an easy conversation, the four of us, and he expressed a generous interest in my daughter’s sketch books. He was impressed with the mythological creatures that she had conjured up and captured on paper. He talked about his artistic process going into interesting details about how lately he has been combining traditional artistic methods with time-saving and innovative digital techniques. 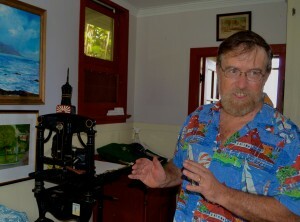 He has a deep love of the ancient arts of calligraphy and the early methods of printmaking, however, and continues to delight in creating handmade books. 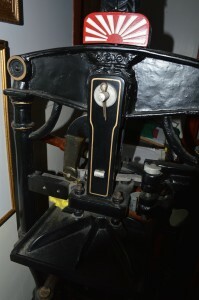 Downstairs in his cozy studio, he showed us the old printing press that was saved from being melted down for its iron during the Second World War. 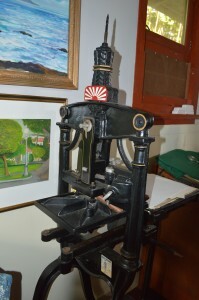 This particular printing press is apparently the only one of its kind extant in the United States. 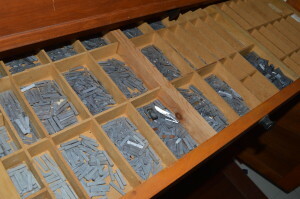 He had drawers full of typeset letters and materials for printing and binding books. 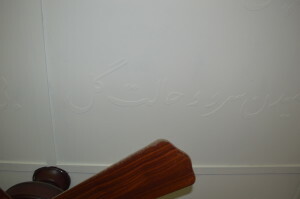 On his ceiling was a lovely white embossed poem written in Arabic. He translated it for us while gesturing and explaining how he achieved the artistic effect. We thanked him for the generous amount of time that he gave us to talk with him and then, as his wife had just returned with the car, offered to drive us back downtown so that we could meet some friends for supper. Before he left, he blessed us with no less than ten hardcover picture books; a gift for which he would accept no monetary thanks. We were floored by his generosity and I happily carried the gift back to our library to share with the students who happily began devouring all of the new books. 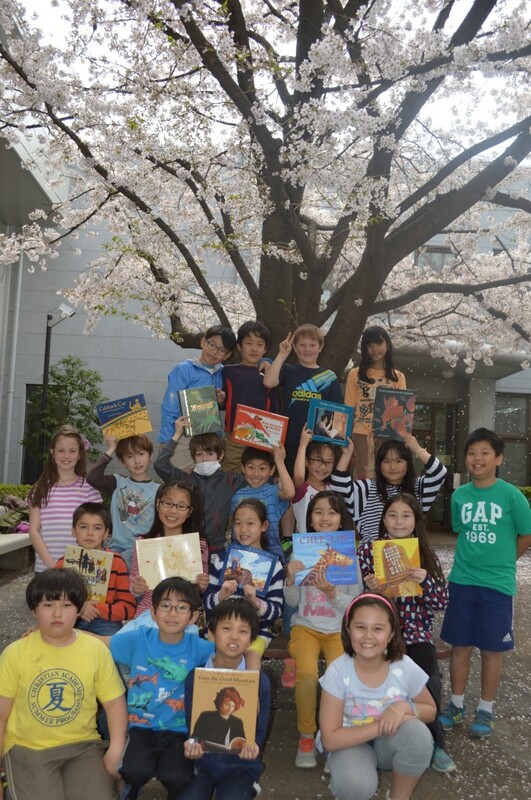 Included in the books was a Japanese translation copy of “From the Good Mountain” which is perfect for our Japanese fluent readers at our international school. It was a true honor and a pleasure to be able to meet and talk with James Rumford. 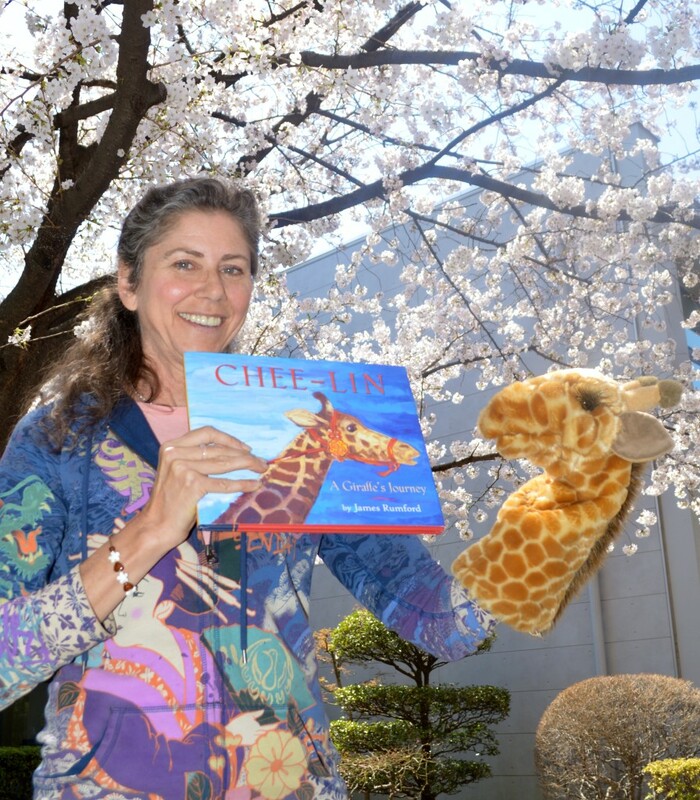 I am hoping that we will be able, with the help of several interested international schools in Tokyo, to set up an author visit so that many students will get the chance to meet this versatile artist. 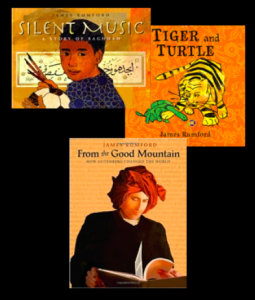 Can’t wait to read these wonderful books from James Rumford! Thank you! Genevieve the Giraffe is thrilled! This entry was posted in publishing, teaching by ruth. Bookmark the permalink.